SEATTLE--(BUSINESS WIRE)--May 1, 2018-- (NASDAQ: AMZN)— Amazon today announced plans to expand its Boston Tech Hub and create an additional 2,000 technology jobs in fields including machine learning, speech science, cloud computing, and robotics engineering. Together with its customer fulfillment facilities, Amazon has created more than 3,500 jobs in Massachusetts and since 2011 invested over $400 million in the state. Amazon’s teams based in the Boston metropolitan area primarily focus on Alexa, Amazon Web Services, and Audible. In particular, the Boston-based machine learning scientists and engineers contribute to enhancing the experience of customers interacting with Alexa, leading the industry in its shift toward conversational artificial intelligence through cutting-edge research and development in machine learning. 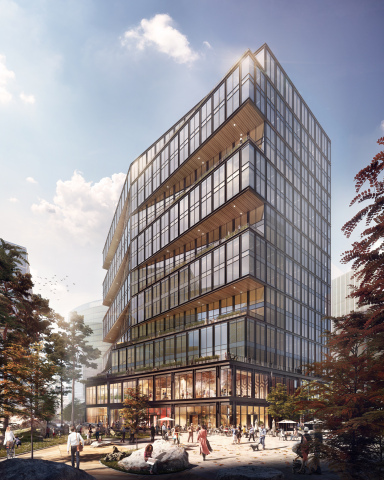 To accommodate the new job creation, Amazon will be expanding into 430,000 square feet in WS Development’s Seaport project – a 7.6 million square feet development transforming the waterfront of Boston – and plans to open the doors of its new office in 2021. This will allow the company to double its tech workforce in the Boston metropolitan area. The construction of this new facility is expected to generate additional funding for job training programs in Boston, providing opportunities for Amazon to work with the city’s Workforce Development team to prepare local residents for jobs in the technology industry. Recently named as the #1 most desirable workplace in the country as part of LinkedIn’s annual survey, Amazon is committed to strengthening the talent pipeline for careers in the technology sector. The company offers a wide range of programs to equip job seekers with the skills for new, in-demand, high-paying jobs – from paid cloud computing apprenticeships specifically designed for military veterans to its Amazon Technical Academy, a program that helps employees gain the fundamental coding and problem solving skills necessary to transition into software engineering roles within the company. Amazon’s customer fulfillment associates can also take advantage of its innovative Career Choice initiative, which prepays 95 percent of the cost of tuition to pursue continuing education courses in in-demand fields, regardless of whether the skills are relevant to a career at Amazon. To date, more than 16,000 Amazonians have utilized the job-retraining programs globally. In 2013, Amazon opened its corporate office in Cambridge, which has served as the anchor for its Boston Tech Hub – one of more than a dozen Tech Hubs nationwide that invent and build new products and services for Amazon customers. The company has recently added additional offices in Back Bay and the Fort Point neighborhoods, in addition to the Amazon Robotics development center in North Reading. Since 2011, Amazon has invested over $400 million in Massachusetts, from building customer fulfillment infrastructure and research facilities to compensation to its teams. The company estimates that these direct investments in the state contributed an additional $40 million to the Massachusetts’ economy and generated an additional 600 indirect jobs on top of the company’s direct hires. There are also tens of thousands of small and medium-sized businesses, authors, and entrepreneurs in Massachusetts who are growing their businesses with tools like Marketplace, Fulfillment By Amazon, Kindle Direct Publishing, and Amazon Web Services. Additionally, as part of Amazon’s ongoing commitment to the communities where our employees live and work, the company recently made a $1 million match offer to St. Mary’s Center to support their efforts to create a new Community Resource Center on their Dorchester campus, and donated more than $100,000 to nonprofits throughout the state of Massachusetts. With more than 566,000 employees worldwide, Amazon ranks #1 on Fast Company’s Most Innovative Companies, #2 in Fortune’s World Most Admired Companies, and #1 on The Harris Poll’s Corporate Reputation survey. Over the past five years, the company has invested more than $100 billion in the U.S., including corporate offices, development and research centers, fulfillment infrastructure, and compensation to its employees. To learn more about working at Amazon, click here. Candidates interested in applying for open roles at Amazon’s Boston Tech Hub can visit www.amazon.jobs/Boston.